As you might have noticed, I am currently a bit slower with the publishing on my blog. It’s autumn, a good time to get the hands on some computer games. But in the meantime I wanted to show you a photo again. 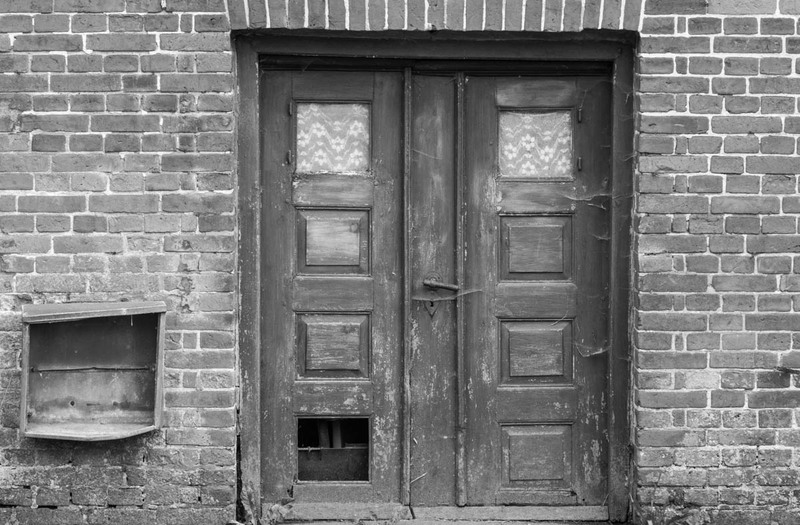 I shot this photo of the old door a while back, I didn’t like how the colours turned out, but I liked the photo after I converted it to black and white. The photo is a nice expansion to my abandoned category. I do really like old materials that suffered, I like the texture of these materials. There are some nice textures in this photo and I agree it looks good in black and white as older things often do. I often use black and white conversion to hide some issues, like to strange colours. But recently I started to admire the black and white effect… you’re right, it sometimes just fits better to certain subjects, like old things. I love the picture. It reminds me of several years ago when I decided to do a collection of photos based on a theme; doors and windows. I took them all in St. Augustine, Florida while my wife and I were on vacation. St. Augustine in the oldest city in the U.S. so I found many picture opportunities. Sounds like a photography paradise then. I like it if old things are still there. My town with the medieval history is similar, it’s just so small that you won’t find new photos subjects anymore at some point, I did at least take photos of all historical buildings in my city I guess. But subjects that have no historical background but are abandoned as well, are still interesting too. That is true about tags. I learned that it is important to use good file names and alt tags for your pictures too so you can find them later. Yes, I didn’t really do that when I started my blog but today I do at least care about file names, and I usually find what I am looking for by using the WordPress media library. But I am a bit more sorted locally on my hard drive with folders and so. Lightroom also helps me to tag images locally. I have resized images on the blog and the high quality images on my hard drive in case I want to edit images again or upload them elsewhere. Do you have them online your doors and windows photo collection? I don’t have them online now. I tried to put them online this morning but I have to open the RAW files and for some reason my Canon software can’t read my Canon Raw files from 2008. I will work on it when I have time and let you know. I hope it’s just the software and not broken files. Alternatively you could install IrfanView, it’s a small but nifty free image viewer. It can’t load RAW, but they have a plugin that makes it possible. When it comes to viewing my images, I always use IrfanView as default windows image viewer, even if I use Lightroom and Photoshop, but they are bulky and not so lightweight as IrfanView. But you probably also want to edit your RAW files, and that’s what IrfanView is not good for… it’s rather just a viewer.